Fun with Baby Alive: Baby Alive Real Surprises on SALE! I have been doing some online shopping for my future Baby Alive Real Surprises. I had thought I would want the Brunette Baby Alive Real Surprises, since I am a brunette. 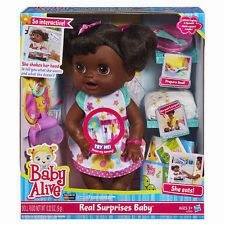 I have also considered getting the African American Baby Alive Real Surprises, since I want a different one than the blonde Baby Alive Real Surprises like my DD has, but I have been unsure which Baby Alive to get. I was just surfing Walmart.com's sight for price comparisons, and the African American Baby Alive Real Surprises dolls are on sale right now for only 34 dollars! This is a great price, so if they are still on sale when I buy my Baby Alive Real Surprises doll, I will JUMP at the chance to get that price. :-) Here is the link!